Join us on one of these great outings to discover the natural treasures of our island. Mileage is total miles. Outings focus on: (C) Conservation/Interpretative, (E) Educational, (F) Family/Fun, and/or (S) Service. Check bit.ly/SCH-kauai for updates to the schedule. Requested donation for members and participants under 18 is $1, all others is $5. Note: Women are advised not to hike remote trails or camp alone on Kauaʻi. How about becoming a Sierra Club Outings Leader? If so, please contact JudyDalton123@gmail.com or call 808-482-1129 to find out how much fun you could be having while giving people the opportunity to explore the island, enjoy its beauty, and inspire them to protect it. Unparalleled views of Waimea Canyon from the other side. Visit the top of the 800-foot Waipo’o Falls and dip your toes into a cool stream before it flows down the waterfall. Offers spectacular panoramic views of the East Side of Kauai. We will explore the mountain on several trails. Starting at Koke’e Lodge we hike to Berry Flat Trail and continue to the northern section of the Ditch Trail. Finally, we loop back to the Waininiua Trail and back to the lodge for a variety of views. The first part of this outing is easy on the bike/walk path up until Donkey Beach. The rest is unpaved and moderately rated. Lovely views along wild coast. Climb to the top of Sleeping Giant. Incredible sweeping views and lush vegetation. We will hike from the rim of Waimea Canyon down to its base and admire the majesty of this canyon along the way. A serious hiker’s dream, these Koke’e ridge trails take you to the most incredible vistas. A real endurance challenge. A gentle steady walk on a wide path with sweeping view of lush valleys and Mount Waiʻaleʻale and Makaleha Mountain Ranges. This trail offers great rewards without a lot of effort. Glorious views and ever-present bird songs reward you along this trail. Hike to bridge and picnic tables for lunch. Spectacular coastal walk with breath taking views along this magnificent coastline! We’ll meet at Lydgate Beach Park in the late afternoon and set off on a lovely walk along a pristine beach with no development in sight for miles. Learn how this beach was saved from being destroyed by a 6-foot high, 3/5th mile long sea wall fronting Wailua Golf Course that the County had attempted to build in 1996. Before setting off on our walk, we’ll have a picnic dinner (not a potluck – bring own food) at Lydgate. We’ll pass through the Kilauea Forest and then the largest mahogany plantation in North America. Then, the trail opens up and we’ll enjoy impressive views of the Mount Namahana, which means “the twin branches” in Hawaiian. Walk along the coast through lagoons and back to Kalapaki Bay. Enjoy sweeping coastal and valley views along the ridge which continues the Sleeping Giant range from Wailua River to Hanama’ulu. Sunset to Full Moon Coastal Walk. East Shore. Moderate 4.5 miles one way (C/E/F). We start off in the late afternoon meeting at Kapa’a Library to shuttle our cars to Donkey Beach starting our walk from there and ending back at the library as we watch the moon rise over the ocean. Learn how the Planning Commission was legally challenged to assure increased building setbacks along the ridge to preserve the views on and along the coastline. We’ll have a picnic dinner at the look out at Donkey Beach. (not a potluck – bring your own food). Hike through beautiful native forests on un-marked Honopu Trail to a spectacular lookout of the Honopu Valley, overlooking the famed NaPali Coast. We will explore spectacular views of the lovely Po’omau Canyon from both sides of the canyon. This hike goes out to lovely views of several waterfalls as the trail makes its way along and through the Makaleha Stream. Often cited as one of the top two hikes on Kauai, but be prepared for an adventure on a wild trail that often requires improvising. 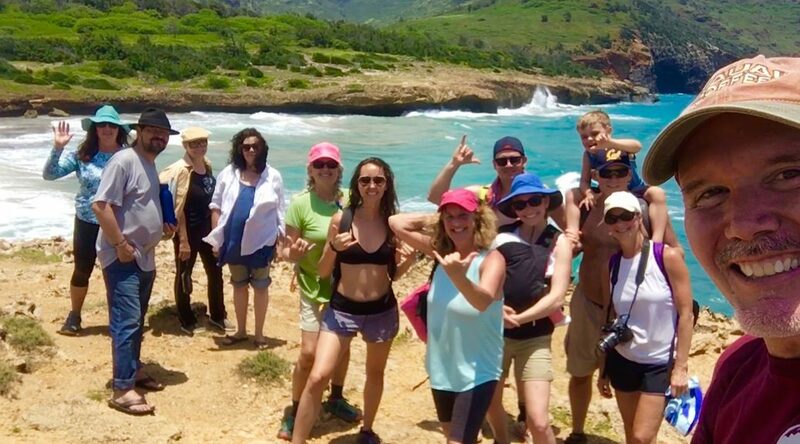 Hike from Kalapakī Beach to Nawiliwili Lighthouse, then along the coast to Hanamāʻulu Bay with shuttleto return. Enjoy views along the rugged coast. We’ll meet at Lydgate Beach Park in the late afternoon and set off on a lovely walk along a pristine beach with no development in sight for miles. Learn how this beach was saved from being destroyed by a 6-foot high, 3/5th mile long sea wall fronting Wailua Golf Course that the County had attempted to build back in1996. Before setting off on our walk, we’ll have a picnic dinner (not a potluck – bring own food) at Lydgate. We will explore lovely panoramic views of the North Shore by following this ridge trail above the Hanalei Valley. The Alaka’i is a primeval habitat made accessible by boardwalks. The Alaka’i, one of the world’s wettest spots, is not a swamp but a mountain rain forest rising 4,500 feet above the Pacific. A variety of native plants and birds can be seen only on this trail. Panoramic view of the North Shore is at trail’s end, when the clouds cooperate. Nounou Mountain, which is also more popularly called “Sleeping Giant”, offers spectacular panoramic views of the East Side of Kauai. We will explore the mountain on several trails.